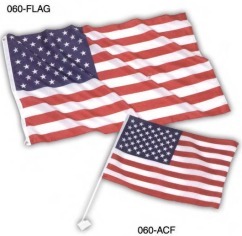 Bulk Patriotic American Car Flags at clearance price. Our American car flags clip easily over car windows. Two Sided: visible from both sides. Show your pride wherever you go. Stitched flag edges to prevent fraying. Reinforced clip to prevent breakage. Our American flags are individually poly bagged. We can insert an optional header card custom imprinted with your logo and message in full color: please check the Price Table below. We also supply large American flags, 5' x 3' (only $5.98 each) , as well as very economical custom imprinted car dealer flags and team car flags: contact us. American clients pay no taxes. PRODUCTION TIME: 7-10 days after art approval; blank American flags ship nextr day. SIZE: 18" x 12". The pole is 18". PACKAGING: individually poly bagged with optional header card in full color. Header Card Size and Size of Imprint: 4" x 6". Setup Charge: $45.00 (it is added only if you order the optional header cards). Wholesale American Car Flags - USA Car Flags, 18 in. x 12 in. with 18 in. pole. Two Sided. Best price in USA.